Call for special fuel discounts! A110-11 MERRILL ARPT WX INFO AVBL ON CTAF (CALL SIGN MERRILL WEATHER) DURG HRS ATCT CLSD OR PHONE 271-4355 DURING HRS WHEN ATCT CLSD. A110-13 USE FREQ 122.55 (RCO) FOR FILING , ACTIVATING & CANCELING FLIGHT PLANS IN THE ANCHORAGE BOWL AREA. A110-14 MRI RWY 5-23 PAVED FIRST 60' REMAINING SFC COMPOSITION IS GRAVEL AND USED SEASONALLY AS A SNOW RUNWAY (SKI EQUIPPED AIRCRAFT USE RECOMMENDED TO MINIMIZE WHEEL RUTTING). A110-19 ALL ACFT IN NON-MOVEMENT AREAS MUST CTC GND CTL PRIOR TO TAXI. A110-22 RY 05/23 REFLECTIVE THLDS & EDGE MARKERS. A110-23 PORTIONS OF TWY C BTN TWY S AND TWY N, AND PORTIONS OF TWY Q NOT VISIBLE FROM THE TWR. TWY Q UNCONTROLLED EAST OF TWY C. TWY G UNCONTROLLED BTN TWY N AND RY 05/23. ALL SURFACES SOUTH OF RY 05/23 UNCONTROLLED. A110-24 TWY B UNCTL SOUTH OF TWY M.
A110-25 COMPASS ROSE AVBL WITH PRIOR CDN FM MERRILL FIELD ATCT. A110-4 SEAGULLS & RAVENS ON AIRPORT. A110-5 PPR FOR ACFT OVR 12500 LBS. A110-6 ALL RWY & TWY LGTS NON-STD HEIGHT. A110-7 1 FT TO 8 FT SNOW BERMS & PILES ADJACENT TO RYS & TAXIWAYS DURING WINTER MONTHS. A110-8 MIGRATORY WATERFOWL ON ARPT SPRING & FALL. A110-9 SEE SEPERATE LISTING FOR HOSP HELI. 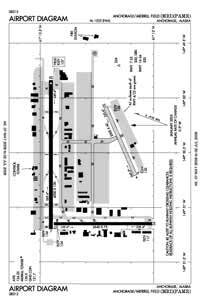 A30-05/23 RY 05/23 PAVED FIRST 60 FT.
A58-34 26 FT BLDG, 220 FT L OF CNTRLN, 0-200 FT FROM RWY THR. A81-APT ACTVT MIRL RYS 07/25 & 16/34; REIL RYS 07, 25; 16 & 34 - CTAF. PAPI RY 34; VASI RYS 07, 25 & 16 OPERATES 24 HRS. E147 TPA FOR ACFT 105 KTS OR LESS 900 FT MSL. ACFT GREATER THAN 105 KTS 1200 FT MSL.